from shore to shore. It did extend from mountain to mountain. was to defend Pearl Harbor from an overland attack from the North Shore. In March of 1942, all the military dependents on the islands were evacuated to the mainland. 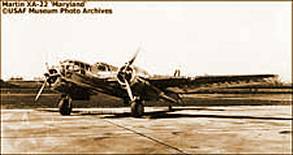 The pilots of the 45th FS helped clean up Wheeler Field, dispersed planes into revetments, etc. 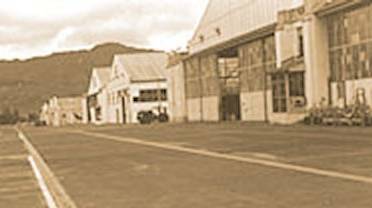 They then moved to an airstrip near Kaena Point, at first flying constant daytime patrols, which quickly wore out both men and machines. They received new planes, P-40E's and Bell P-39 Airacobra, both of which had their drawbacks. The Model E Warhawk was even heavier and more sluggish than its pre- decessors, and the Airacobras had an unfortunate tendency to tumble. Throughout the summer of 1942, the 45th FS pilots led a fairly dull life: gunnery practice and flying patrols. His nephew LaVerne made a paper model of the P40E while he lived at Merril's parents. During the first wave of the Japanese attack on Pearl Harbor on December 7, 1941, 25 dive-bombers dropped approximately 35 bombs on the hangars at Wheeler Field. "Look more like Martin A30 Baltimores to me". 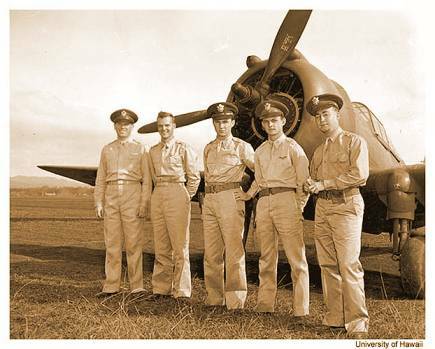 Standing before a Curtiss P-36 fighter, one of the few that survived, five USAAF pilots who shot down one or more enemy aircraft pose for a photograph. From left to right: 1st Lt. Lewis M. Sanders (1 victory), 2nd Lt. Phillip M. Rasmussen (1 victory), 2nd Lt. Kenneth M. Taylor (2 victories), 2nd Lt. George S. Welch (4 victories) and 2nd Lt. Harry W. Brown (1 victory). Together, these 5 pilots shot down nine Japanese aircraft confirmed, with 4 probables and two damaged. This amounts to nearly 1/3 of all Japanese aircraft lost during the Pearl Harbor attack. Three of the men are wearing sidearms, indicating that they were probably on duty when this photo was taken. Frank Mattausch and the other soldiers at Wheeler Field knew something was up. The Army base was placed on alert more than a week before Dec. 7. The Army Air Corps' 135 fighter planes, the main air defense for the island of Oahu, were sheltered around the edge of the air field inside more than 100 revetments, U-shaped earthen walls eight feet high that served as bunkers. But on Friday, Dec. 5, orders from the top came to remove the aircraft from those bunkers, and they were parked in front of the hangars. On Saturday, the pursuit squadrons decided to do some marching on the flight line and moved the aircraft together. So when Mattausch, a machinist at the base, awoke at 7:30 on Sunday morning, Dec. 7, the planes were out in the open along the hangars — in clear view and a perfect target. And despite the earlier alert, no one expected anything to happen. "We didn't think the Japanese would dare," Mattausch said. Mattausch pulled on his trousers, socks and shoes and walked into the washroom. He was living in a barracks room with seven other sergeants, several of whom were still asleep. It was a little after 7:45 a.m. when he walked back into the room. "Out the window we could see some planes that came through Kolekole Pass and headed past the mountains toward Pearl Harbor," Mattausch said. "And just a second later another plane pulled out of a dive about 200 feet up, and a little black speck left the airplane." It might have been the first bomb of the Japanese attack on Hawaii, and it hit Wheeler Field. "As the bomb was still falling I remember somebody shook one of the guys who was sleeping and said, 'Wake up, Longdyke! The war's started!' " Mattausch said. Mattausch grabbed the shirt and tie off his bed and ran down the hallway and down the stairs, getting dressed as he moved. And just then the Japanese bombed the hangar across the street from the barracks, about 50 feet away. The barracks shook violently but it wasn't hit. He and six other men raced to a supply room they knew contained a .50-caliber machine gun on a tripod. It was locked up behind a wood- and chicken-wire partition, which they quickly yanked down. They set the machine gun up on the back porch and Tech. Sgt. Bill Bayham, Mattausch's boss and a World War I veteran, began firing, shooting down one of the planes, Mattausch said. Mattausch and six other men were given Army commendations for establishing machine gun firing positions in the midst of the bomb attack. And days later, a Movietone newsreel crew shot some footage of Bill Bayham. "Bill's sister wrote that she was at a theater in Dayton, Ohio, and all of a sudden there's his picture on the screen," Mattausch said. "She yelled, 'That's my brother!' Everybody clapped and they stopped it and ran it back through a few times." Though the one hangar was the only one bombed, the damage to Wheeler was devastating. The base had no anti-aircraft guns or air raid shelters. "The attack didn't last very long, and afterwards I went down on the flight line — just a whole bunch of burning planes," he said. Thirty-four people were killed, mostly soldiers living in a tent city who were hit by stray Japanese machine gun fire during the attack. Ninety of the 135 planes were destroyed. Only 45 could be salvaged. 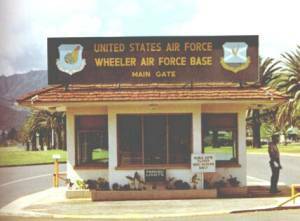 But one squadron from Wheeler had airplanes at a gunnery field on the north end of Oahu. Eight pilots drove to the gunnery field after the attack started and got their planes in the skies and shot down 12 enemy aircraft. "That indicates how different the battle would have been if we'd been able to get all our planes into the air," Mattausch said. After the bombing, the Army feared the Japanese would be sending in paratroops, so the soldiers stayed up for three days guarding the air field, Mattausch said. No one was allowed back in barracks, he said. "We were just dead exhausted after that three days," he said. Mattausch remained at Wheeler until 1942. Later he joined an outfit that traveled to the Gilbert Islands and set up an airfield on Makin after the Army infantry landing in 1943.